So what did President Obama get in return for the most sweeping shift in US policy toward Cuba in nearly half a century? A public kick in the pants from Fidel Castro. The ailing despot left no doubt about who runs things in Havana — and it isn’t his brother, Raul, Cuba’s president. After Raul declared he was “willing” to discuss issues like human rights and political prisoners with Obama, Fidel responded with an essay on a state-controlled Web site that said, essentially, not so fast. Thanks for nothing, in other words, for lifting restrictions on Cuban-Americans’ ability to send their families cash. That’s more than Cuba has gotten from any US president since Dwight Eisenhower. Which is just what Obama should have expected, after making those gestures without demanding anything of Castro. Well, here’s an idea from Rep. Peter King — most definitely not a bootlicker. The Long Island Republican has reintroduced legislation demanding the extradition of 70 US criminals — including cop-killers, terrorists and airplane hijackers — who have won political asylum in Cuba. * Joanne Chesimard, a Black Liberation Army terrorist who in 1973 took part in a shootout on the New Jersey Turnpike that left one state trooper dead and seriously wounded another. She escaped from a maximum-security prison and eventually surfaced in Havana — where she remains free today. * William Morales, chief bomb-maker for the Puerto Rican terrorist group FALN, which staged scores of bombings, some deadly, throughout New York City. Escaping from Bellevue’s prison unit, he made his way to Mexico, where he killed a cop. But the government sent him to Cuba, where he was given safe haven. New Jersey Attorney General Anne Milgram says she plans to ask Obama to seek Chesimard’s extradition. Obviously, the best way to “help President Obama” — as well as millions of long-suffering Cubans — would be to restore democracy to the island. President Obama took a significant step. After viewing this film, some may gain a new understanding of the Obama foreign policy and the view taken by the likes of the castro brothers and Hugo Chavez. Only in our current movie, nobody has to attack the United states and lose. In Obama world, the evil dictators just roll over, the president of the united states says he’s sorry, and undoubtedly, better relations and foreign aid may follow. On March 21, 2009, Venezuela’s President Hugo Chavez said his U.S. counterpart Barack Obama was at best an “ignoramus” for saying the socialist leader exported terrorism and obstructed progress in Latin America. “He goes and accuses me of exporting terrorism: the least I can say is that he’s a poor ignoramus; he should read and study a little to understand reality,” said Chavez. “When I saw Obama saying what he said, I put the decision back in the drawer; let’s wait and see,” Chavez said on his weekly television show. 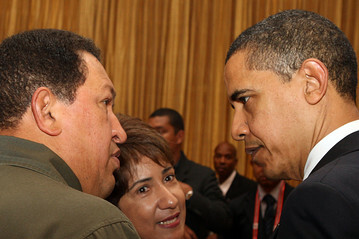 This weekend, Chavez started his education of Barack Obama in person. Chavez gave Barack Obama a copy of “Open Veins of Latin America: Five Centuries of the Pillage of a Continent,” by Uruguayan journalist Eduardo Galeano, who blames foreign interests like the United States for exploiting Latin America for centuries. President Obama addresses reporters before leaving Trinidad for Washington on Sunday. Many in the U.S. are not applauding Obama’s good grace in meeting with Mr. Chavez and accepting his “gift.”. “This bolstered Chavez at home. It costs people their freedom and in some cases their lives. Obama is now serving Chavez’s interests,” said a latin American expert at the State Department, on the condition of anonymity. “It emboldens both Castro and Chavez to have the President of the United States as their buddies and tells them they can get away with murder. I think it sends all the wrong signals from the U.S. to Cuba and Venezuela,” he said. 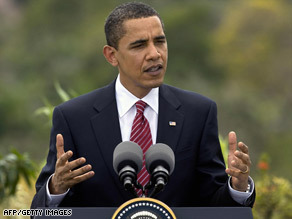 President Barack Obama said Sunday that he “strengthens our hand” by reaching out to enemies of the United States. Asked what an “Obama doctrine” would be, he declined to give a specific answer, but he outlined broad principles such as the importance of listening to other countries. The United States, Obama said, remains the most powerful nation in the world but cannot solve problems such as climate change, drugs and terrorism on its own. “If you start with that approach, you are inclined to listen, and not just talk,” he said. Ensign said the president was “irresponsible” during his Latin American trip.